A very varied group of characters is faced against the madness of all sorts of horrors lurking beyond. Divers set of archetypes, offering multiple playing styles and ways to deal with the supernatural threats of all kinds. So far (core set and the spoilers we got from the first deluxe expansion) FFG is doing a good job individualizing them. It’s possible because designers started with multiple tools allowing for customizing investigators. Each investigator has not only different skill values or class. They also have a unique special ability and an individual effect resolving when an Elder Sign is drawn from the Chaos Bag during a skill check (Elder Sign effect). 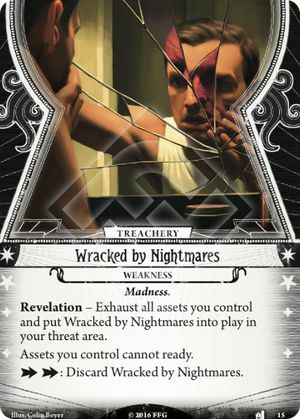 It does not stop here, though – every character has their own special cards being mandatory part of their deck, both for good and evil (signature cards). 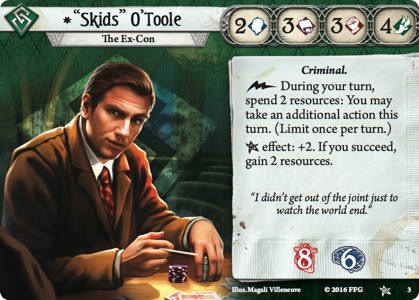 The deck-building requirements/options, unique for each character also contribute heavily to make every investigator feel special. Arkham uses a different approach to skills than its 2 predecessors. First of all, the amount of skills is the lowest (4). It is definitely a good design choice due to the skill icon/skill check mechanic. If there were too many possible checks, the icons would be useful too rarely. What is bit less obvious, though, is that each skill has a designated “specialized” test, even if not explicitly mentioned in the rules in case of Will (used for casting spells; Combat is used for the fight tests, Lore for investigating and Agility for evading). Both Arkham Horror and Eldritch Horror had a skill not directly linked to any purpose (Luck and Observation, respectively). In a way skill system supports some sort of specialization – since it is not possible to be good at every aspect of the game, it’s better to succeed at most of Fight tests, than at 20% of Fight and Evade, for instance. On the other hand, encounter cards or any other scenario related content can ask for a skill check of any kind. For this reason low value of a skill might cause trouble (“Grasping Hands” for low Agility character might be tough to deal with, even more if you draw it more than once etc.). On top of that, you are very often forced to investigate (as discovering clues drives the scenario’s progress) and sometimes to fight (not only evading forever is not always an option, but also scenario asks you to kill an enemy on occasions). Skill value of 1 might therefore really mess up with progress of your investigation. And since character will most probably excel in class-related skill(s), there might not be too many options to mitigate the weakness with cards available to them (unless neutral ones). This particular point can either shape the whole playing style of a character, or easily just be a supportive thing, allowing for multiple ways of leading the character. 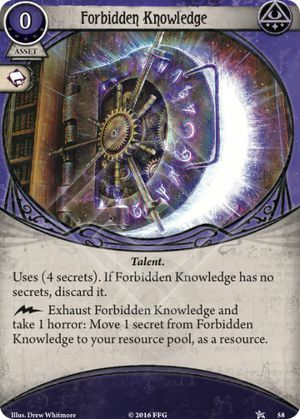 Without going into much detail, consider these examples – while Agnes’ ability encourages you to find synergies like “Forbidden Knowledge”, Skids’ extra action allows for more of a versatile and adaptive approach, based on scenarios’ needs. Regardless of its nature, unique special ability truly adds distinctive feel to the character and makes each of them exceptional. Elder Sign effect (I guess it’s the best way to call the other half of investigator’s ability) is a very nice touch from a design point of view. Even though you rarely draw the symbol, it’s a great feeling to actually see it in your hand and be able to apply the effect. I am therefore bit disappointed with the implementation. Why? Well, to answer this question we must make a very basic observation – most of tokens in the chaos bag have a negative modifier. Therefore, when attempting a skill check, one tries for the skill value to be higher than difficulty. As a result, all the Elder Sign effects boosting the skill value are not too useful, as skill value most probably was higher than the skill difficulty anyway. The exceptions are very rare and include some desperate long shots aimed specifically at drawing an Elder Sign, or a test forced by scenario/encounter deck. More creative ideas for the Elder Sign effect, like giving resources or allowing to draw cards are not only much more playable, but very often much more thematic as well. FFG team did an excellent job coming up with idea of signature cards. You do feel so much like the character you’re playing, when you can use the very special effect granted by an individualized card. It creates an even greater playing experience (at least for me) to be faced with personalized character flaw. It not only widens the spectrum of possible results and choices, but also brings the game one step closer to a role-playing experience. Signature cards can also interact in many interesting ways with each other and/or character’s abilities. So far each investigator got 2 signature cards – one “good card” and one “bad card” (well, a weakness, technically speaking). The “good one” being an asset/event (though I could easily imagine a skill as well) . 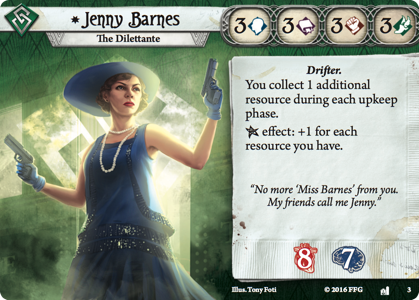 This approach will most probably be kept for most of the characters, but I wouldn’t be surprised if an investigator got more cards for some thematic/game-play reason. Final note will include strength of the positive cards and drawback of negative ones; hence a character with a very good positive card might still only score a “3” if they also have a devastating weakness. Each investigator has a limited pool of cards to choose from, when creating their own deck. The core set characters have access to 2 cards belonging to 2 classes (unlimited options in their primary class and limited selection of high level cards in their secondary class), as well as the neutral ones. The Dunwich investigators can use all the cards of their class and any 5 of other classes albeit only on 0 level. We can expect different deck-building options for other characters; I personally wouldn’t appreciate too sophisticated ones (like the one chosen for Marie), as it seems to mess too much with the class idea. Class itself might only be a thematic description, indicator of investigator’s type, based on the fact that Marie cannot use all the Mystic cards (she might be one of a kind exception, but then again, she might not). I would, however, prefer it to be both a solid high-level archetype, shaping both basic idea of an investigator (his skill values, ability etc.) and their deck-building options – in my opinion character of a certain class should always be able to take any card of that class. I strongly believe that card choice affects the investigator’s style the most, as AH:TCG is… well a card game. A player can choose almost 90% of cards in their deck, even with signature cards system in place. 2 different investigators with same deck would feel much more similar, than 2 completely different decks for the same investigator. Currently there are not too many options for a varied deck-building. Card pool will slowly, but steady grow in time, though. I hope we’ll get to see more high level cards, especially, allowing for a great character development (nice touch, mechanism similar to Mage Knight – deck-building seems to be able to nicely provide mechanic means for depicting character’s progress). And since the deck is limited in size, with many 0 level cards being a must have (to be replaced with their higher level copies, perhaps) cards with “Permanent” keyword will come in very handy. Not to mention, they provide a very strong RPG feel. Limiting the card pool available to each investigator is a brilliant design choice. First of all, it makes each investigator different; it links playing cards with the investigator, with the archetype, with the class. This way it nicely presents how different means are open to an FBI Agent and a University Librarian, skilled in occult and magic. Second of all, it makes deck-building itself less important and puts the focus on actual playing. It might be matter of taste; I am not a big fun of deck-building and value the genuine game-play far higher. You spend less time creating perfect set of cards and more being your character. Have you noticed the restriction "No Fortune card"? Nice touch! I’m going to publish a post about every investigator, giving my opinion on each aspect of their design. As mentioned in the opening post, both game-play and theme aspect will be mentioned. I will try to throw in as much advice and ideas in the mix as I can– feel free to be inspired, even by the untested ones. Zoey's God-given mission has started back in Arkham Horror days and is still ongoing.